It's deep couch sitting, Olympic watching, me. I forgot how much I love volleyball. I don't remember watching ANY of the London Summer Olympics. I haven't been completely unproductive. I've been rebuilding a roadside find for the August Fab Furniture Flippin' Contest. So I'm committed to this piece. Otherwise I would have put it back on the curb after I looked at it more closely. 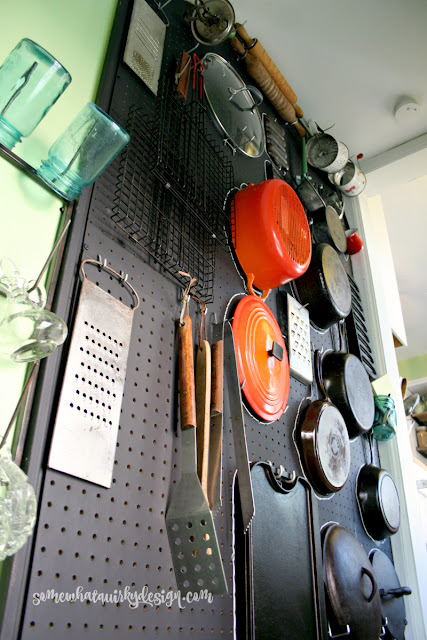 Let's talk about the cool giant peg board I built for storing a bunch of my kitchen stuff. 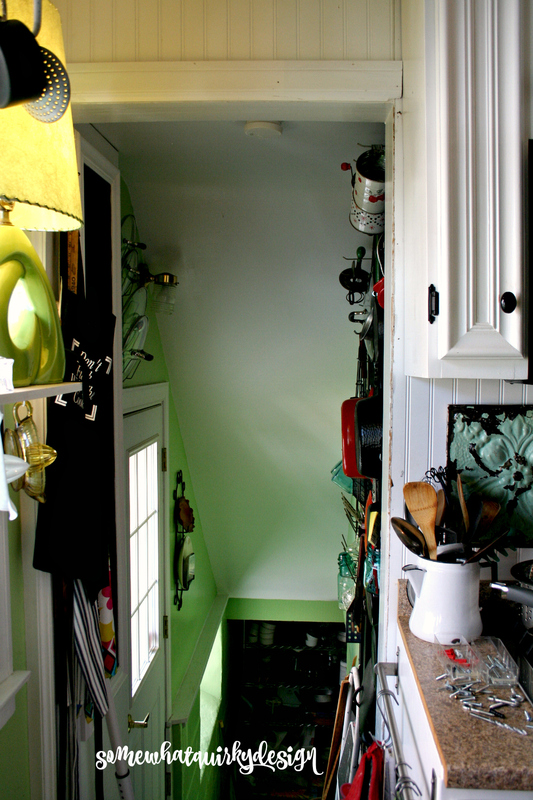 You may remember that my kitchen is small - and low on storage areas. I have pared down the kitchen stuff I keep, but I like kitchen stuff and don't want to get rid of all my vintage stuff. I decided to put the peg board in the stairwell that leads to my basement. There is a tiny pantry embedded in the wall on the left. I installed all this to the right. Going down, there are two stairs, then a platform where the side door opens, then the rest of the stairs. A good part of the hanging stuff can be reached from the kitchen doorway. The rest I access from the platform. My first priority was to have a place to store my cast iron pieces. They are so dang heavy and cumbersome. My cabinets are too small for them and my pot rack is full. 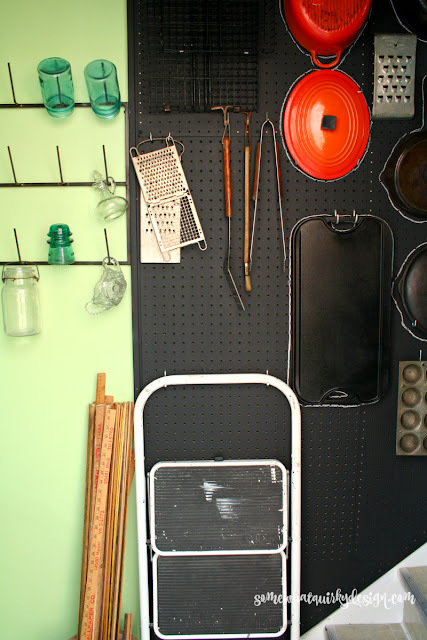 I bought 3 sheets of peg board at an estate sale (at least two years ago, maybe three) for 50 cents each. I estimate that these pieces were at least 30 years old. These sheets will be referred to as "vintage" for the remainder of this post. Once I had the vintage peg board I began to collect the hardware pieces for it. You know, those hooks and pegs and little racks and things that you hang your stuff on. I probably bought 3 boxes of random pieces for a dollar a box, or less, over the years. So, one day I finally got a bug to get this done. Drill with various small bits. 1. Attached the 1x2 mounting strips to the wall with 3" screws. I pre-drilled the wood and the plaster wall. These strips should be spaced so that there will be room on each vertical half so that a peg board can be attached to each half. 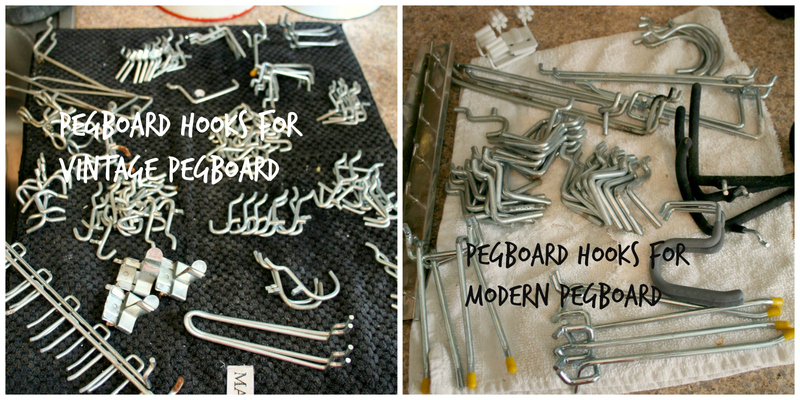 I used at least 4 screws for every 8 ft of mounting board. This wall is very thick plaster and I decided that I didn't want to mess with wall anchors. At the very least I probably should have used them for the top screw on each board. But I did not. I thought that the weight distribution of the finished product would reinforce the stability of the screws. Could I be wrong? Of course. 2. 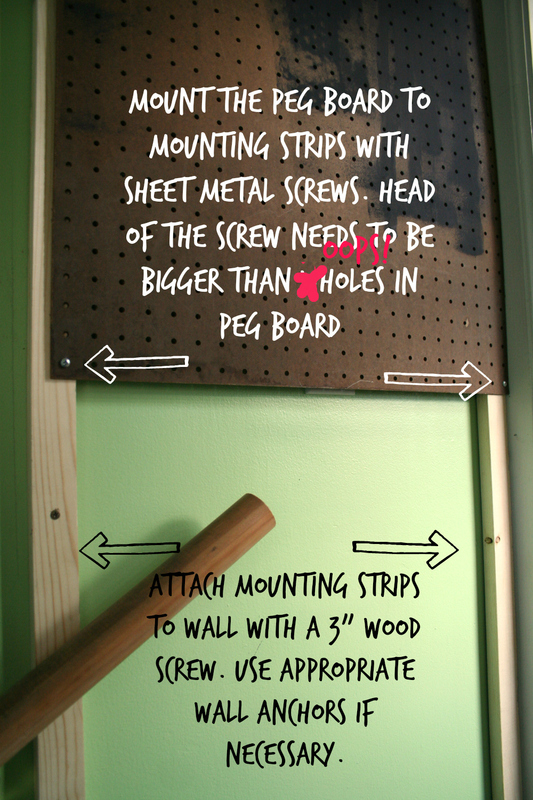 Attached the peg board to mounting strips with 2" sheet metal screws. I used three on each side. These screws were long enough to go into the plaster as well. NOTE: mounting strips are necessary because the hanging hardware pokes through the holes in the board and needs wiggle room. You could easily use some sort of spacer or nut behind the board to create this space. That is up to you. 3. Mounted corner molding over edge of the edge of the side of the outside mounting strip. NOTE: My board was against a wall on one side. If your peg board is exposed on each side you will want the corner molding around each edge. 4. 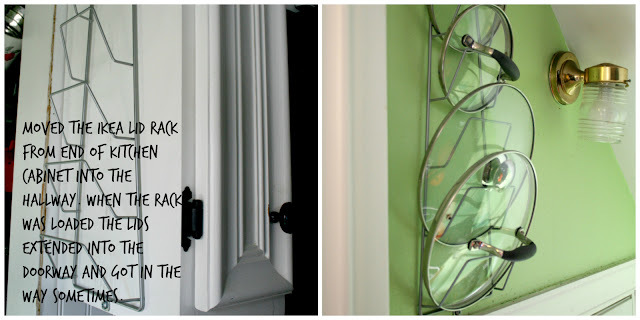 Painted with black chalkboard paint. This could be done with any paint you desire. Note: If you paint the mounting strips BEFORE you mount the peg board, you won't have wood showing through the holes in the peg board. 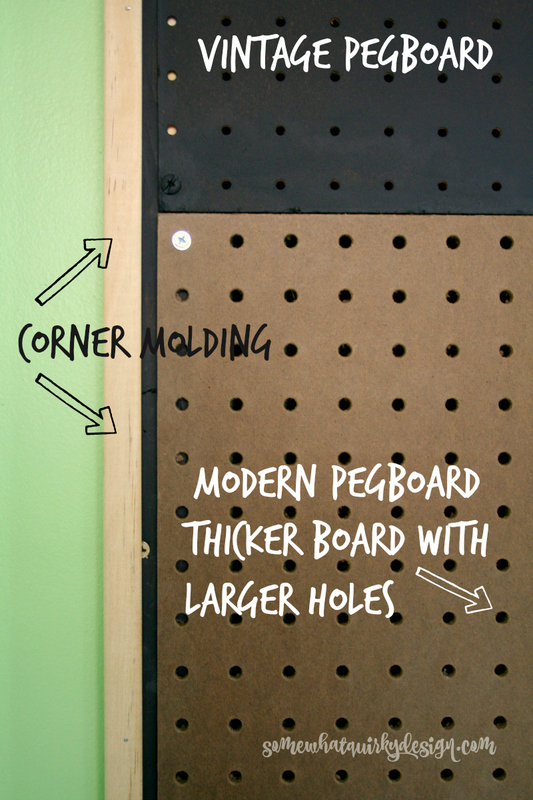 I didn't figure this out until I was mounting my last piece of peg board. 5. Attached all the hanging hardware. I picked what I judged the best hardware for each individual item that needed to be hung. Note: A big surprise was that my vintage peg board was thinner and had smaller holes than the new piece that I had to buy to fill out the area. The new hardware is very heavy duty compared to the vintage stuff. It will come in handy if I ever build a peg board for my tools and stuff. 6. Drew an outline around the cast iron pieces so I would know where they belonged. I can't believe I waited so long to do it. I had actually planed to put this rack ON the peg board, but I guess I had more stuff than I thought! I moved my Ikea lid rack from the end of the cabinet (and thus sticking into the doorway to the basement) to the same hallway above head level but reachable. I'm so flippin' glad to have this thing done. The hardest part of this project was taking the dang pictures. I guess stairwell photography is just not my thing. What do you think of my storage hallway? 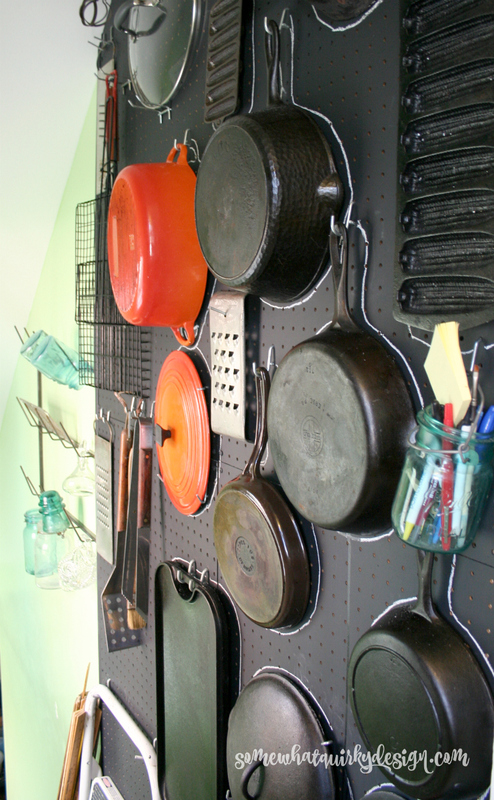 Aren't you glad you don't have to store your frying pans in your hall? Karen you are a genius. You will be thanking yourself every time you hang something back in its very own place. Pinning. Hugs. What a great idea! I have plenty of room for everything I own in my current kitchen (I even have empty cabinets!) but I'm planning to move to a smaller home in the future so I'm pinning this project for later use! I have too much vintage kitchen stuff. I should get rid of some of it. Lollollollollolhahahahahahahalollollolhahahaaaaaaa..... I made myself laugh! Oh, my sides hurt! Nope, not getting rid of my vintage stuff, I like it way too much and actually use a good percentage of it on a regular basis. I have gifted special people who love vintage and antique kitchen ware with something special every once in a while but that's a completely different thing. That's sharing the love! You are a clever woman! I, too, am very space challenged and a collector of kitchen stuff. I have racks etc., everywhere I can put them. There is little wall space near my kitchen to use your idea. Your post brought back great memories of when my late father solved a storage problem for me in a little apartment that my parents rented for me when I was suddenly left a single mother. 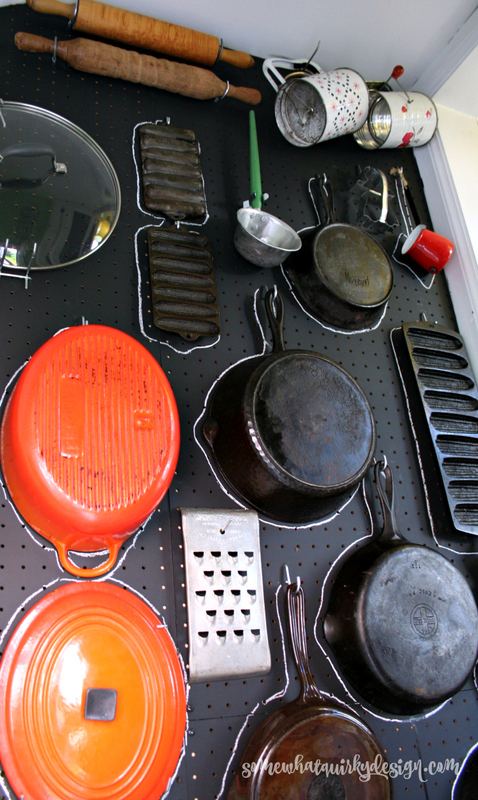 Daddy put pegboard in several places in the kitchen which had no cabinets except under the sink. It worked very, very well. 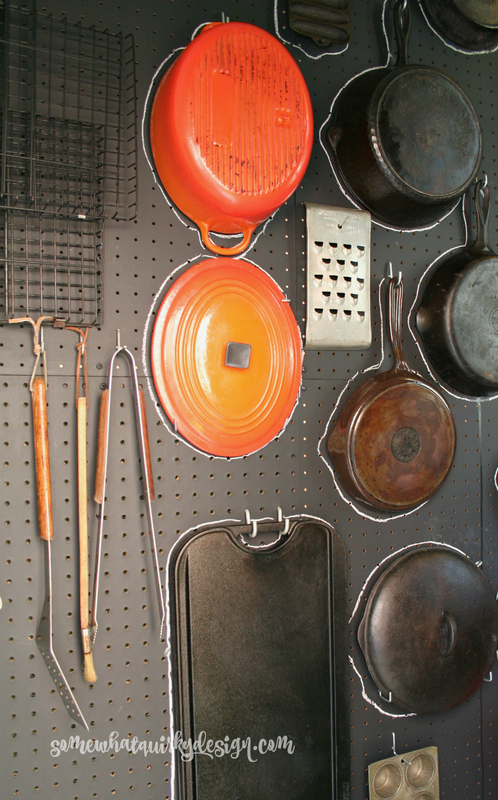 I have some pegboard now in my garage where the previous homeowner installed it like a backsplash between the upper and lower cabinets. I keep my rolls of various tape on the pegs. I think you made great use of that space which would otherwise be wasted, and I love the Julia Child touch of outlining the skillets so you can tell what goes where. 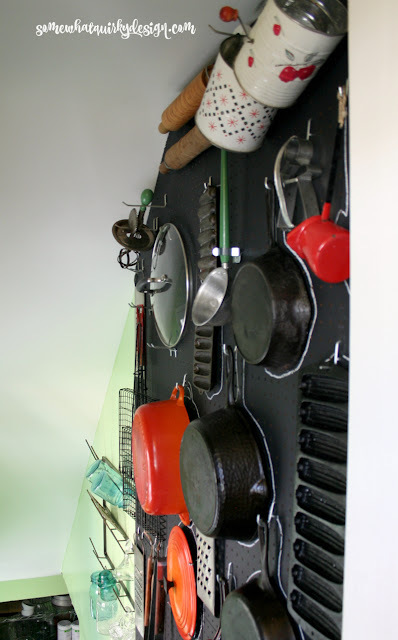 Wow, great idea to store your kitchen wear on the wall. I would have done the same. Happy you shared your idea with Dishing it and Digging it link party. We love having you. Thanks again and have a great week. 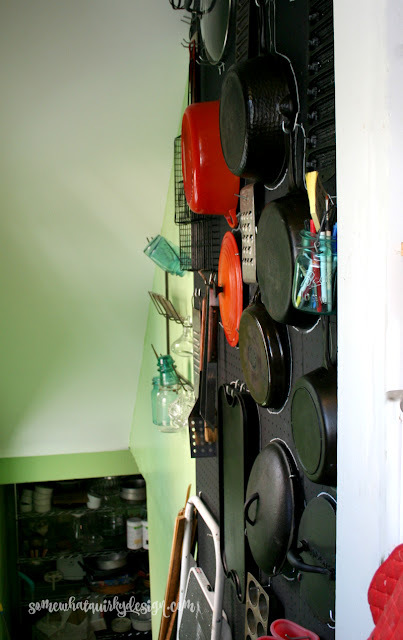 I have space for all my cooking stuff...EXceeeept... my cast iron skillets, which happens to be all I cook with. So when they're all clean. They sit out on my vintage stove! I'm kind of over that look! I was thinking of hanging them on the wall with some old heavy nails, but I don't want them banging against the wall. I should do something like this. Hmmm... you have the cogs spinning in the thinker! I also think this is a great use of space and ... you did quite well getting the photos too. Now that is the way to use the space you have! 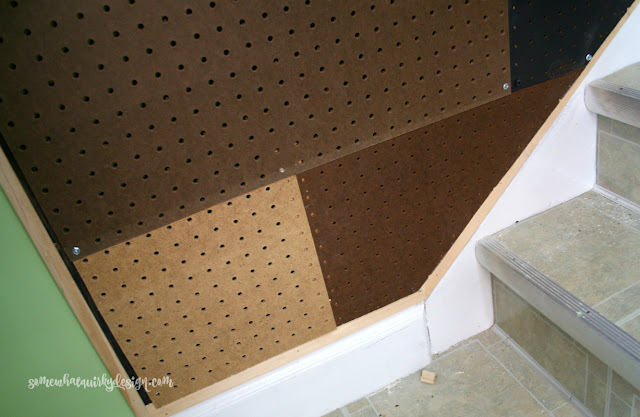 It turned out great and wow, did you use every inch of that peg board! You did some serious organizing! Hey that's pretty cool actually. I like the chalk lines, smart, and anyone who tells you that stairway photography is their thing is a liar. So neat! I'd have to get some nice cast iron pans to fill it up with though. I could also use this idea to add some more storage to my climate control storage units - gotta squeeze every inch out of those things that you can!